I woke up to the sound of my alarm clock going off and I realized I set it for the wrong time! I hurried out to the barn to feed Starlight. She nickered as I fed her her morning oats. After I was done mucking out the stalls, I hurried to school. When I got home, I changed and went out to the barn and I said hi to Starlight and asked her if she wanted to go for a ride. I tacked her up and rode to the nearest horse market. On our way there, I could not believe my eyes! 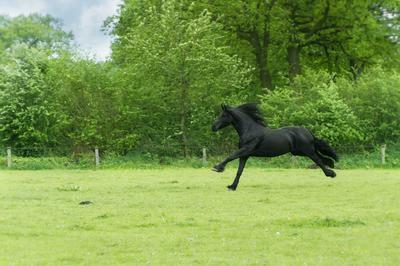 A black horse was getting pulled by a man. I counted 20 whip marks. I could plainly see this horse was abused. I asked the man if he was for sale and he said he was only 300 dollars so that night I begged my mom to let me have another horse and I could pay for it with my allowance. She finally said yes. The next day, I hurried to the horse auction and got the black quarter horse. I took him home, bathed him and gave him water. He was lucky I saved him. "Lucky! That should be his name!" I said good night to Lucky and Starlight. I think I will have a wonderful time riding Lucky. Hey, next time give a little more detail! But nice story! Maybe you rushed a bit...but it's good. Could you write more? Please?